EDM carbide inserts are removable cutting tips that help to improve your EDM machine. These EDM power feed contacts promote faster machining and better finishes on the products. They are not brazed or welded to the tool body, so they can be removed. They are usually indexable, meaning that they can be exchanged, rotated, or flipped without disturbing the tool. The EDM power feed contacts and wire cut carbide inserts are designed to produce high quality, strong products that typical EDM equipment can’t achieve. McWilliams carries a variety of contacts for your wire EDM machine from many popular brands, including Japax and Sodick. Carbide, also called hard metal, is a popular manufacturing material because it offers beneficial characteristics. With its wear-resistance and superior strength, carbide is used for saws, drills, end mills, insert cutters and other machine parts. This carbide contact is used for Japax brand wire EDM machines for use on Japt 3F, 3FM, 3J, and 4G controls. 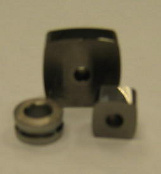 McWilliams supplies a range of EDM carbide inserts for Japax and other popular EDM machines. This carbide contact is a square insert that is used for Japax brand wire EDM machine. It is for use on Japt 3F, 3FM, 3J, and 4G controls. This carbide contact is a larger square insert that is designed for Japt 4G controls for AF4 Japax brand wire EDM machines. This rectangular carbide contact is designed for type 87-3 Sodick brand wire EDM machines. It is useful for non-AWT machines, as well as newer AWT machines. This carbide contact is a round, cylindrical upper AWT type machine. It is designed for use with Sodick brand wire EDM machines. McWilliams Sales & Services offers a large assortment of EDM consumables for all makes and models of EDM machines. We have long-term relationships with leading manufacturers and can provide you with the highest quality wire cut carbide contacts and other consumables to improve your production process. For more about our EDM consumables, contact us today.